Because unauthorized migration is driven primarily by the search for better wages (Kochhar 2005), the undocumented migrant is commonly thought of as a young, male worker usually unaccompanied by a wife or children. In fact, the full portrait of the unauthorized migrant population is more varied. Unauthorized migrants also live as couples (sometimes with a spouse who is a U.S. citizen or legal immigrant), and many of these couples have children. Some children are U.S. citizens and some are unauthorized, and sometimes there are both U.S. citizen and unauthorized children in the same family. There are also hundreds of thousands of single women. The unauthorized population included about 5.4 million adult males which is a little less than half of the 11.1 million total in the March 2005 estimate. There were more unauthorized adult men than women, with those 5.4 million males accounting for 58% of the 9.3 million unauthorized adults in the March 2005 estimates. (See Figure 6.) Approximately half of the adult men, or 2.4 million, were “solo males,” i.e., in the U.S. without wives or children (Figure 7). There were approximately 3.9 million adult women in the unauthorized migrant population, representing 42% of the adults in the March 2005 estimate. Among adult women, only one in five, or about 730,000, is “solo”— in the U.S. without a husband or children (Figure 7). 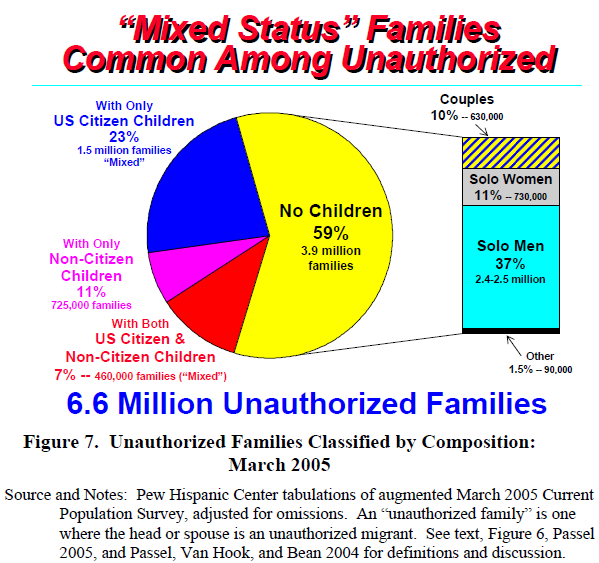 There were 6.6 million unauthorized families in March 2005—defined here as a family unit (or solo individual) in which the head or spouse is unauthorized. Since unauthorized families can include U.S. citizens and legal residents as well as unauthorized migrants, the total number of persons in unauthorized families was 14.6 million, a figure that includes the 11.1 million unauthorized migrants. 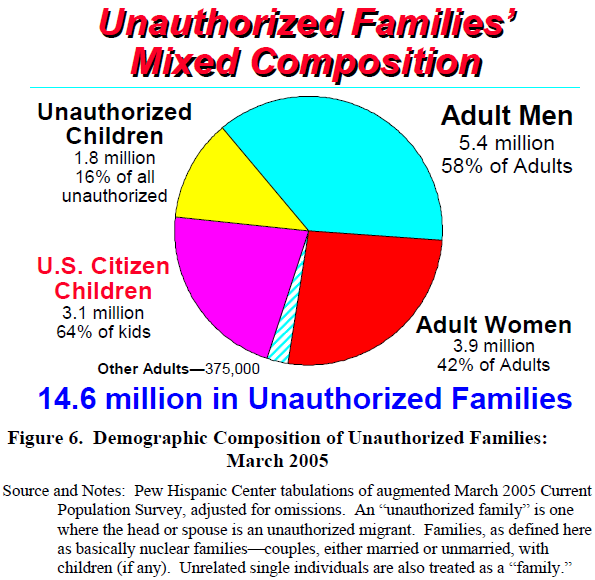 A majority of these unauthorized families—3.9 million, or 59%—did not have children (Figure 7). They were made up of single adults, couples, or some other combination of adult relatives. The vast majority of these—about 3.2 million of the families without children—were solo individuals.